BANGI, 19 December 2014 – Malaysians have shown the least interest about ASEAN compared to all the nationals of other member nations of the grouping. Several surveys carried out by The National University of Malaysia (UKM), the Ministry of Foreign Affairs and other government agencies found Malaysians emerging last in the studies when compared to data from other ASEAN countries. Speakers of a Bicara Persada forum on Nay Pyi Taw ASEAN Community Declaration 2015 – 2025: Is There A Future Together? at UKM here today discussed ASEAN’s future and were disappointed to find that many respondents didn’t even know that Malaysia will assume the chair of the grouping this January when ASEAN becomes an integrated economic community. 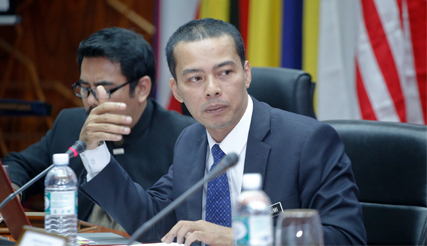 The Director of the Foreign Ministry’s ASEAN Community Political-Security Section, Mohd Suhaimi Jaafar said research done by Wismaputra showed that only 34% of respondents knew that Malaysia would chair the grouping in 2015. “Many respondents couldn’t even name all the member states, let alone being aware that in 2015 ASEAN would be an integrated economy,” Suhaimi lamented. He explained that only recently ASEAN held its 25th summit in Nay Pyi Taw, Myanmar and very few people knew or cared about it. Another panelist Deputy International Trade and Industry Minister (MITI) Datuk Ir Hj Hamim Samuri said in the run-up to Malaysia taking over the chair in 2015, MITI produced a blue-print of trade liberalisation, a requirement for the integrated community. “Only 3 out of 10 Malaysian businesses were interested, despite the enormous potential for expanding trade within ASEAN. There was just little interest,” Datuk Hamim said. He said probably Malaysians are more interested in politics than the economy and trade, to which Suhaimi responded that Malaysians are too complacent about their future. Another panelist Law Faculty senior lecturer Dr Salawati Mat Basir agreed that there was a lack of awareness among Malaysians about Malaysia’s future in ASEAN. They seem to be more interested in shopping in the neigbouring countries. “As an anecdotal evidence, I know that Malaysians love to shop in Vietnam and Thailand where textiles are cheaper than in Malaysia. My group goes shopping in Thailand. We are only interested in looking for cheap sales,” Dr Salwati quipped, to the amusement of the audience. More seriously she predicted that the integrated community meant that Malaysians must be prepared to find work as expatriates in other ASEAN countries. However, this would only be possible if all the member states adopt a common system of Law, Trade and Education. “Malaysians are not cosmopoliltan enough to venture out. We have to impress on our students to change their mindset and be willing to work in Singapore, Jakarta or Bangkok. However the laws (between the members) are not the same, so it makes my job (as a Law lecturer) more difficult,” she said. Dr Salwati said there must also be political will within all the member states to make that possible and it has to start with harmonising all procedures. The fourth panelist, Deputy Rector of Universitas Andalas in Sumatra Prof Dr Ir Helmi, was more optimistic poiting out that many Malaysian companies were already making their presence felt in some of the other ASEAN nations, if not in all of them. “There are now about 1,000 Malaysian companies operating in ASEAN countries. I can only mention a few, such as Air Asia, Maybank and CIMB. But there is a potential for even bigger trade in sectors such as retail and even halal products,” he predicted. He gave the example of Indonesian students studying in Malaysia, which have reached the tens of thousands. As of December 2012, about 6,000 Malaysians were studying in Indonesia while about 14,000 Indonesians were pursuing higher education in Malaysia. The forum was moderated by broadcaster Nizal Muhammad.